I’m up early because it’s going to be one very busy Saturday! There’s always work to do in the kitchen and today, I burst into action with some of those super quick and easy Top Banana Fairy Cakes and then throw together a Zucchini Frittata. I’m going to Kathy’s house later for a Thermomix demo, and Kathy has asked us all to bring a plate, so, naturally, I’m taking two! In truth, my last banana of the bunch was really about to expire, and so I had no choice but to bake and take the fairy cakes. So much more fun to share! Anyways, while the cakes are cooling, I pop off for a quick trot around the block. I try out a new free running app on my iphone MyASICS which is super cool. It tells me how long I run (time and distance) and my average speed per kilometre! Way cool! Despite having run more than half a half marathon on Thursday, I’m feeling in fine fettle. Back at the ranch, there’s just time to shower, change and ice those little baby banana cakes before Kathy collects me and Tracey to take us over to hers for the long-awaited Thermomix demo! Kathy is already the proud owner of one of these marvellous machines and has been waxing lyrical about it for a while! I can’t wait to see it in action! A couple of other of Kathy’s friends join us and before we even get started with the Thermomix, the table is full of food. Everyone brings a plate and just looking at that table is enough to make my tummy rumble and my mouth water, all at the same time! There’s Tracey’s Rocky Road. This should carry a government health warning because it’s so dangerously addictive! Viv brings a beautiful Peach and Raspberry Tart which is simple yet scrumptious! Phoebe and Kent bring some dark and decadent Triple Choc Orange Muffins and we mustn’t forget my Zucchini Frittata and the Top Banana Fairy Cakes! 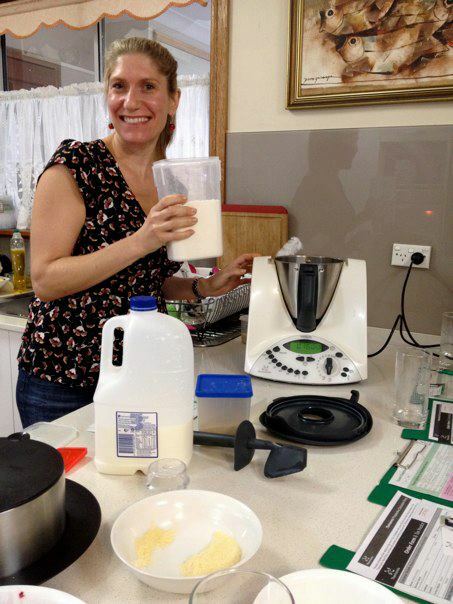 But then Yvonne arrives and it’s time to get tricky with the Thermomix. This machine is incredible. I don’t think there’s nothing it can’t do. 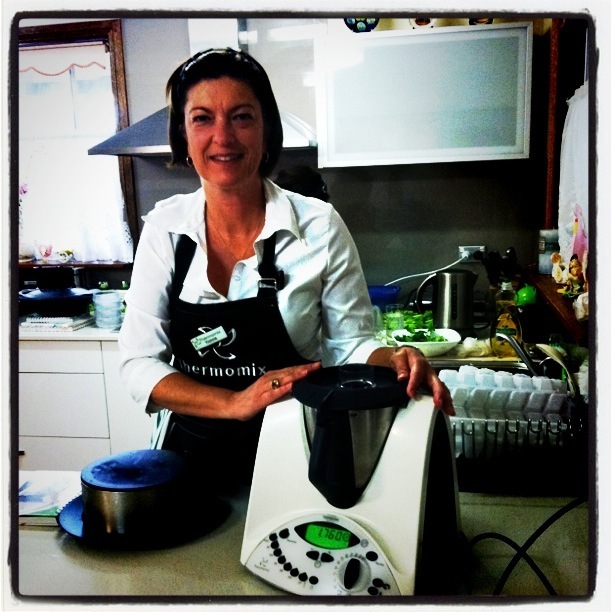 Our first taste of thermomix magic, is when Yvonne throws some sugar, ice, bananas and an egg white into the machine and makes banana sorbet – in minutes! It’s fast and it’s fabulous! Yum-oh! Next up, Yvonne whips up some hummus faster than the speed of light – with just one pot to wash up! Hey Presto! There’s more kitchen magic as Yvonne, produces an amazing Carrot, Beetroot and Mint Salad, you’ve guessed it, in nano seconds! Then there’s bread dough mixed and kneaded in minutes, a risotto in 17 minutes (look, no stirring!) and I get stuck in and knock up a lemon custard in 7 minutes! We taste test all this uber fast, truly tasty food and it’s all fabulous! I don’t think we’d have believed that one machine could create all this kitchen magic, if we hadn’t seen it with our own eyes! It really does have to be seen to be believed! The demo has been enlightening! I can understand why you can’t buy one of these little beauties in the shops. Seeing is believing and you really do need to see it in action! It’s definitely food for thought! Post demo, we tuck into our share plates and Kathy dishes up her best-ever Wonton Soup. She is Wonton Wonder Woman that’s for sure! 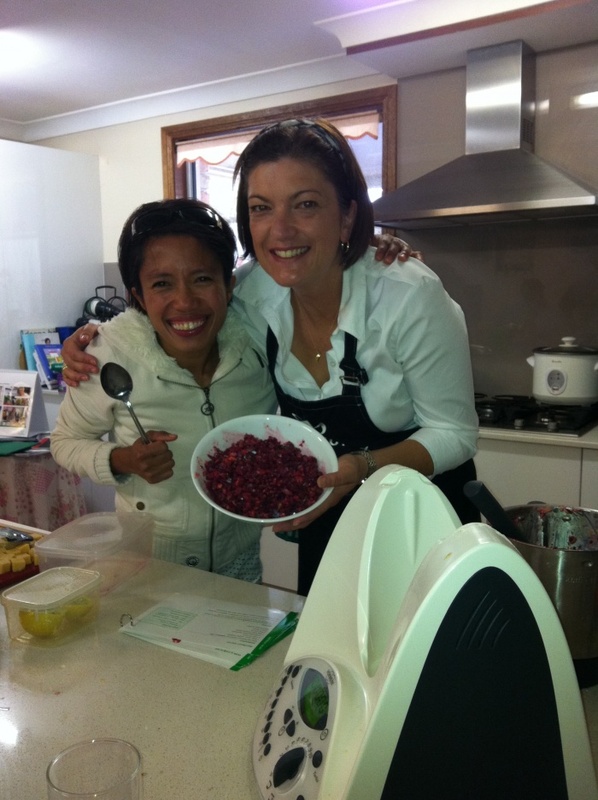 Her mum produces some Beef Caldareta, a Phillipino dish, which is a total taste explosion! She tells me her secret weapon is a Caldareta packet mix from the Phillipino shop! Can you believe it? I can’t wait to get my hands on a packet! I am fit to burst with all these yummy treats. Time to make a sharp exit! Alice drives me home and I have a night on the sofa to look forward to. Bring on Biggest Loser! I have a night out of the kitchen and tonight, David’s getting his hands dirty and makes his speciality a la maison Simple Beef Pies with a splendid side of pumpkin mash! This always gets the thumbs up!